Identifying the theme in a story is really tricky, even for the most seasoned adult. So you can imagine what it is like asking a 10 year old to try! Yet, in our standards, that is one thing that appears quite a bit. As a result, I have tried to make it as accessible to my students as possible. This week, our story has some underlying themes that are a bit easier for the students to grasp, so this seemed like the perfect opportunity to hit them with a little theme lesson. First, we discussed what theme actually is (and how it differs from main idea...SO hard for them!!!) We talked about how theme is the overall idea, meaning, or message that the author wants to convey. They seemed to understand that the theme helps them to get an idea of what an author thinks is important and can give lessons that are useful in life. Then this is where thing begin to get hairy. Most of the time, themes are not directly stated. We have to use clues from the text to infer what the author's message most likely is. Yeah...clues, inferences, analyzing ideas....not the most straightforward of standards. But something that *is* straightforward are the actions of the characters. The kids can easily read those. Using that as a stepping off point, I had them create a Multi-flow map to fill out as we were reading our story. This was a one sided multi-flow. The event was the theme of the story. The causes were the characters actions, as well as the things that happened to the character. All of these clues in the story contribute to the overall theme. As we were reading the story, the students helped me to fill in the map. They were on the look out for things the characters did, as well as things that were happening around them. Once all of this was discovered, it actually was plain as day what the theme was! We are learning theme right now in my 3rd grade class and my students are having so much trouble! I will have to give this a try! Love the worksheet! Theme is SO tough! We use the Treasures reading series and it's a reoccurring strategy. I had to supplement actually teaching it to my kiddos, because they were very confused. It's our first year too!! We are finally starting to figure it out. It would be great to chat about how you structure your Comm Arts time. We have a 90 minute block each day to cram everything (and writing) in! I would love to see a copy of your Anchor map or the flow map you created with your students! I'm teaching response to literature right now and my kiddos are struggling as well. Thank you! Thanks for this great resource! Theme is SO hard to teach. I'll will certainly have to give this a try. You could add a section on motif too. 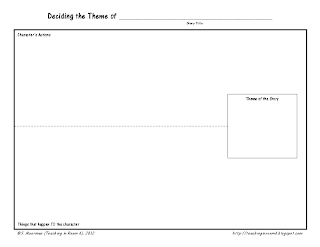 Draw line through the middle of the page and compare and contrast the themes to the motifs. Thanks for the graphic organizer. I really like it.